This past weekend was déjà vu for me. Last season I was one ground shy of completing all the grounds in League One, thanks to Rochdale’s postponement. I never achieved that record, and now with Chesterfield being postponed it looks like it will happen again. When I look at the modern game, I see a great need for something to change in the FA’s policy on matches being played or postponed in the snow and icy conditions. Last Monday, Manchester City played a game which should never have gone ahead due to the amount of snow on the pitch, even with the undersoil heating. When you compare this to Charlton’s postponement last season at home to Southampton, you see there is no consistent postponement procedure in operation. Sadly, money and Sky TV affects the decision-making process more than anything else and fans aren’t taken into consideration. 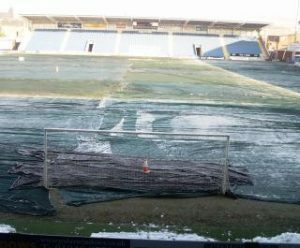 The pitch at The b2net Stadium was apparently playable on Friday, which may have been the case, but everyone saw the forecast of temperatures overnight of -7 degrees. I would have hoped some common sense would have come into play, as a ground without undersoil heating was never going to sustain such low temperatures. What I think the FA needs to implement is some consistency regarding giving notice on postponements. I know you will always have a pocket of fans coming long distance or leaving early and so it’s impossible to not inconvenience everyone, but my proposal would be a common mileage theme. If the game is within, say, 50 miles (Brentford for example) then you can afford to have a pitch inspection at 10-11am as it wouldn’t cost the majority of the spectators that much. Most of them would not have even left their homes yet. A major stumbling block is that it requires a designated match official to officially postpone a game. I understand the neutrality here, but I think some powers need to be bestowed upon the ground staff. 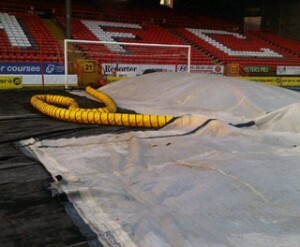 The Charlton match last week against Rochdale was deemed unplayable at 7am by the groundsman but they could not postpone till an official had arrived at 9am by which time Rochdale supporters had already started their journey. There has been a call for a winter break for English football, but I personally think this is a silly idea as we can never judge which games will be off and on when the fixtures are made. But if we were to start the season a week earlier or end it a week later, we could have a week in April with no football fixtures known as a ‘catch up week’. Most teams have at least one game called off each season so this would allow a Saturday for carried over fixtures taking a strain off the players and the loyal fans who can’t always make the long trips on a Tuesday night. For teams which have 2+ games postponed it will be up to the clubs to organise which of the games postponed is to be played in catch up week. What do you think? On a brighter note, we are still top despite not playing for a fortnight! Previous Post How close are we?